David Wilson gets his inspiration from his clients. 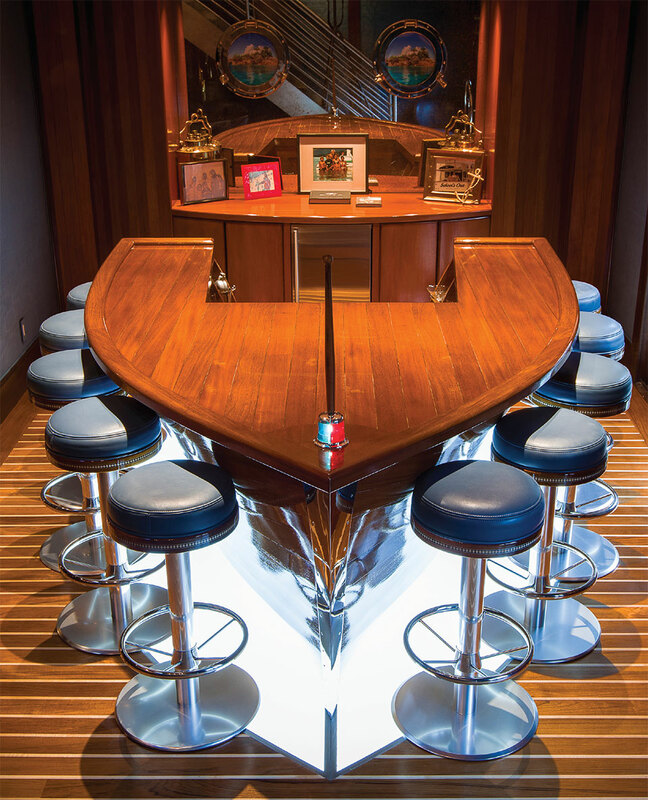 Take the custom bar built from a Chris-Craft boat for a party room. Chris-Craft boats depict 1940s and ‘50s retro style perfectly. The bar evokes an aesthetic that is not just fun but perpetually nostalgic. The Chris-Craft boat is reminiscent of a time gone by, conjuring up images of Esther Williams, local lakes, and distant shores–a perfect match for Gretchen and Baldy. Wilson’s client was building out the quintessential mountain condominium, and the opportunity to celebrate the waterman side of the client’s life gave way to an iconic centerpiece just like in the movies, partly because Wilson is an avid fisherman himself. 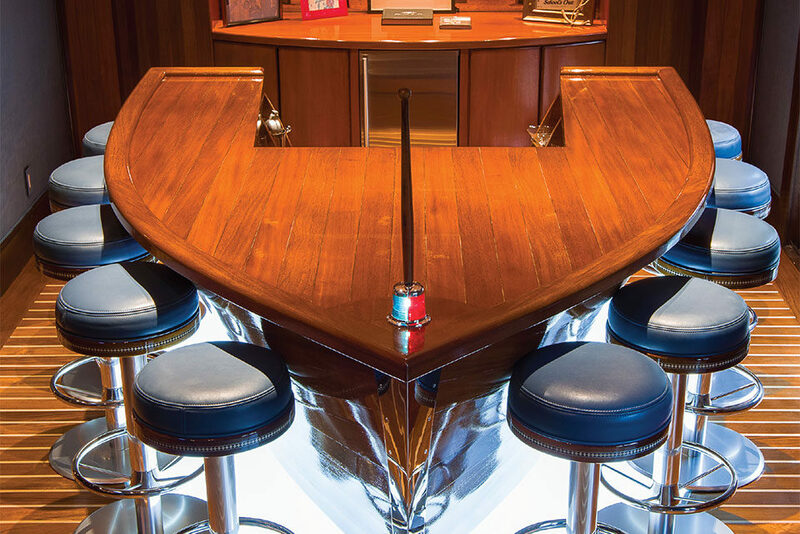 The bar is made from the front half of the boat, and guests sit around the boat while enjoying their drinks. The floor is backlit with an LED panel under blue glass, giving the appearance of sitting on the water while you enjoy your cocktail. It was the perfect match for the client and Wilson’s design brainchild along with the architect Jim Ruscitto. The entire room boasts a nautical theme. “I bought the plans off of the internet and our finish carpenters constructed the boat with painstaking attention to detail,” explains Wilson. The Chris-Craft boat bar is only one of the many jaw-dropping construction-build projects that Wilson can take credit for. Wilson Construction built the Our Lady of the Snow Catholic Church in Ketchum, the 511 Building, the Scott Building, US Bank, and the Campion Ice House in Hailey as well as numerous private homes in the Valley. One of his most well-known projects is the Figge Barn, regularly used as a venue for the Sun Valley Wine Auction. The staircase is exquisite geometry and a favorite of many visitors. Wilson rebuilt the 100-year-old barn on the property and then constructed a four-story staircase made from materials sourced out of Burley, Idaho. Wilson loves building, and according to his wife could do it anywhere he wanted. “David has been contracted for work in Vail, Santa Barbara, and LA,” she says. But it’s hard to imagine David Wilson living and skiing anywhere else but the Wood River Valley. Wilson has been the Mayor of Sun Valley, City Councilman, President of the National Association of Home Builders, and is a board member of the Sun Valley Ski Education Foundation. Wilson has also chaired the Sun Valley Wine Auction. He and his wife Trish have been in the Valley for 38 years, 35 of them in Ketchum. They raised their twins here and remain devoted participants in the local community. And Wilson is obviously doing an amazing job keeping that equilateral triangle in balance. The company has completed 91 jobs in 18 years, with an average of four new builds or five large remodels per year. Most of Wilson Construction’s projects are large and expansive properties ranging from 7,000 to 12,000 square feet. Wilson also adheres to his clients’ needs with the utmost respect. He’s been building for 50 years and his strategy is to get it right from start to finish. Thus, Wilson Construction typically has about 20-30 year-round employees so that they can handle every leg of the building journey. They have their own framers, paint crew, and finish carpenters so they can stay on schedule and remain in complete control for the duration of the project. Wilson’s wife, Trish, who is also the bookkeeper for the firm, notes, “We have had two employees who have been with us for 25 years, and 10 employees who have been with us for over 10 years.” She’s right, that’s saying something in a mountain town. When asked about today’s mountain home, Wilson offers that there’s a little bit of everything but that there is one thing they all have in common—warmth. “We use a lot of recycled materials, recently a lot of 100-year-old oak from Belgium. The trend has been to use timbers and now you’re seeing a lot of modern expressions with glass and steel. The trends change with the demographic but a mountain home is always a house with warmth in its appearance,” explains Wilson. Wilson says that stone is one of the most popular materials to incorporate throughout a mountain house. He’s been sourcing it mainly from a region in Montana but has also included some materials from Challis and the quarry out East Fork in Triumph.